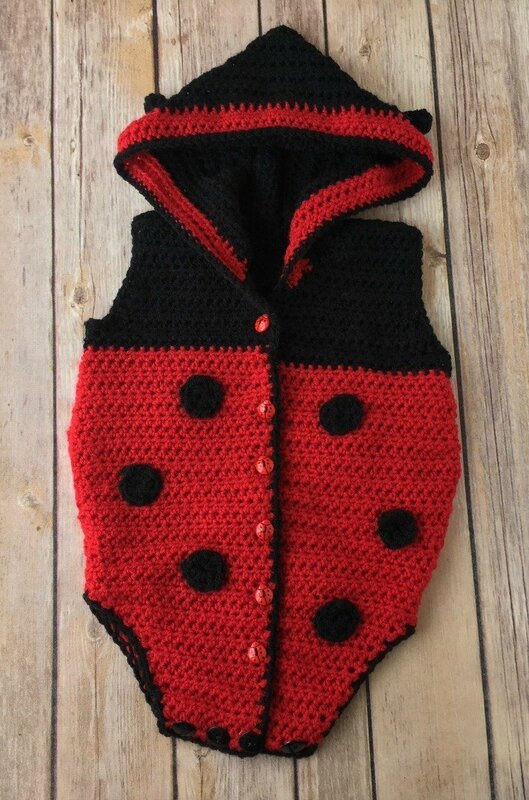 Spring Ladybug Onesie - Free Crochet Pattern - love. life. yarn. Spring has definitely arrived! We have been enjoying temperatures in the upper 70’s and low 80’s and I am so happy to have warmer weather again. We had a very mild winter in Middle TN which was a nice change, but I am so ready to be outside again. Our family loves to be outside and to go hiking, camping, enjoying the nearby playgrounds, being in our garden, etc. so it’s no surprise that this is one of our favorite times of the year. With three little boys you know we are outside every chance we get! 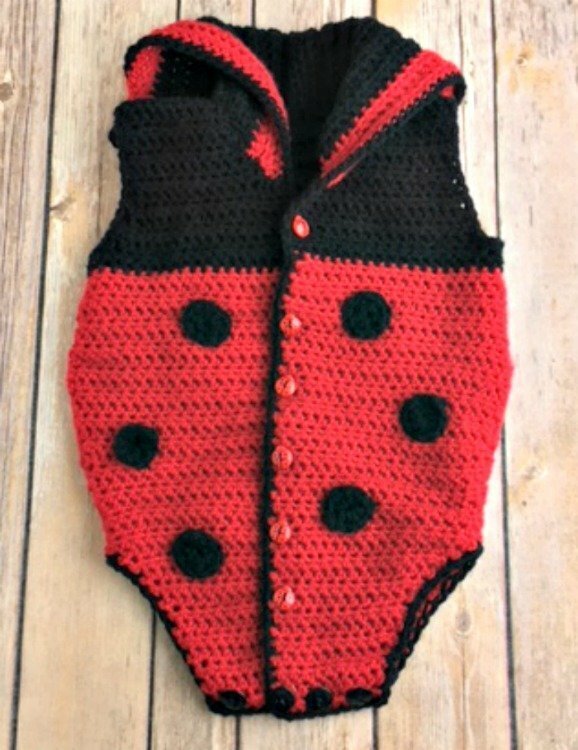 I designed this Ladybug Onesie for I Like Crochet magazine. 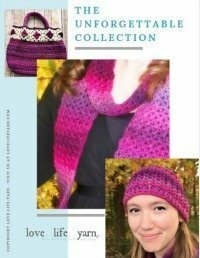 If you’ve checked out the pattern offerings on this blog, you know that I love, love, love to design baby things. This is true for the blog as well as for publication. Any time I see a call for submissions that includes baby things I am super excited!! 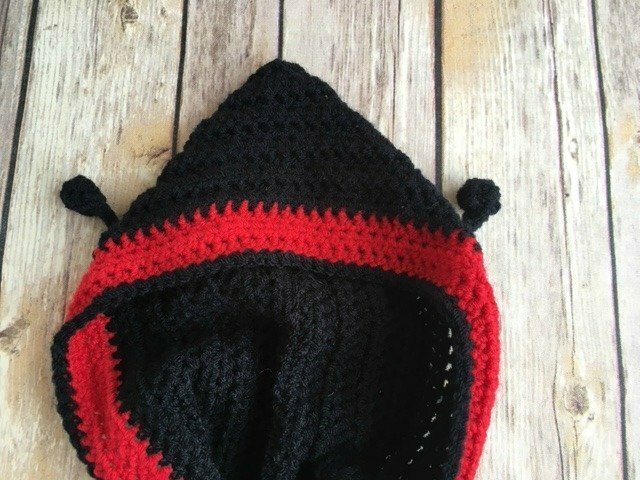 This is a quick project that would make a great gift or super cute Halloween costume. This pattern has a button front and crotch opening (gotta be practical!) for easy dressing and changing, a hood with antennae, ladybug spots, and cute little ladybug buttons. CLICK HERE to buy the ad-free, downloadable pdf for only $1.99! With MC, ch 12 (14, 16, 18, 20). Row 1: Hdc in 3rd ch from hook and in each ch across row, turn – 10 (12, 14, 16, 18) sts. Row 2: Ch 2, 2 hdc in first st, hdc in each st across row to last st, 2 hdc in last st, turn – 12 (14, 16, 18, 20) sts. Row 3: Ch 2, work even in hdc across row. Row 4: Rep Row 2 – 14 (16, 18, 20, 22) sts. Row 5: Rep Row 2 – 16 (18, 20, 22, 24) sts. Rows 6-7: Work even in hdc across row. Row 8: Rep Row 2 – 18 (20, 22, 24, 26) sts. Row 9: Rep Row 2 – 20 (22, 24, 26, 28) sts. Row 10: Rep Row 2 – 22 (24, 26, 28, 30) sts. Row 11: Rep Row 2 – 24 (26, 28, 30, 32) sts. Row 12: Work even in hdc across row. Row 13: Rep Row 2 – 26 (28, 30, 32, 34) sts. Row 14: Rep Row 2 – 28 (30, 32, 34, 36) sts. Rows 15-16: Work even in hdc across row. Row 17: Rep Row 2 – 30 (32, 34, 36, 38) sts. Rows 18-19: Work even in hdc across row. Row 20: Rep Row 2 – 32 (34, 36, 38, 40) sts. Rows 21-22: Work even in hdc across row. Row 23: Rep Row 2 – 34 (36, 38, 40, 42) sts. Rows 24-25: Work even in hdc across row. Row 26: Rep Row 2 – 36 (38, 40, 42, 44) sts. Work – (2, 4, 6, 8) rows even in hdc across row. Row 27: Ch 2, hdc2tog, hdc in each st across row to last 2 sts, hdc2tog, turn – 34 (36, 38, 40, 42) sts. Rows 28-29: Work even in hdc across row. Row 30: Rep Row 27 – 32 (34, 36, 38, 40) sts. Row 31: Work even in hdc across row. Rows 32-33: Work even in hdc across row. Row 34: Sl st in first 2 (2, 2, 3, 3) sts, ch 2, hdc to last 2 sts, leave last 2 (2, 2, 3, 3) unworked, turn – 28 (30, 32, 32, 34) sts. Row 35: Work even in hdc across row. Row 36: Rep Row 27 – 26 (28, 30, 30, 32) sts. Row 37: Work even in hdc across row. Row 38: Rep Row 27 – 24 (26, 28, 28, 30) sts. Rows 39-45: Work even in hdc across row. Row 46: Ch 2, hdc in first 6 (6, 8, 8, 10) sts, leaving rem sts unworked. Join yarn at opposite edge, ch 2, hdc in first 6 (6, 8, 8, 10) sts, leaving rem sts unworked. Fasten off. Ch 8 (9, 10, 11, 12). Row 1: Hdc in 3rd ch from hook and in each ch across row, turn – 6 (7, 8, 9, 10) sts. Row 2: Ch 2, 2 hdc in first st, hdc in each st across to end of row, turn – 7 (8, 9, 10, 11) sts. Row 4: Rep Row 2 – 8 (9, 10, 11, 12) sts. Row 5: Ch 2, hdc in each st across row to last st, 2 hdc in last st, turn – 9 (10, 11, 12, 13) sts. Row 8: Rep Row 2 – 10 (11, 12, 13, 14) sts. Row 9: Rep Row 5 – 11 (12, 13, 14, 15) sts. Row 10: Rep Row 2 – 12 (13, 14, 15, 16) sts. Row 11: Rep Row 5 – 13 (14, 15, 16, 17) sts. Row 13: Rep Row 5 – 14 (15, 16, 17, 18) sts. Row 14: Rep Row 2 – 15 (16, 17, 18, 19) sts. Row 17: Rep Row 5 – 16 (17, 18, 19, 20) sts. Row 20: Rep Row 2 – 17 (18, 19, 20, 21) sts. Row 23: Rep Row 5 – 18 (19, 20, 21, 22) sts. Row 26: Rep Row 2 – 19 (20, 21, 22, 23) sts. Row 27: Ch 2, hdc in each st across row to last 2 sts, hdc2tog, turn – 18 (19, 20, 21, 22) sts. Row 30: Ch 2, hdc2tog, hdc in each st across to end of row, turn – 17 (18, 19, 20, 21) sts. Row 34: Sl st in first 2 (2, 2, 3, 3) sts, ch 2, hdc to end of row, turn – 15 (16, 17, 17, 18) sts. Row 36: Rep Row 30 – 14 (15, 16, 16, 17) sts. Row 38: Rep Row 30 – 13 (14, 15, 15, 16) sts. Row 39: Sl st in first 3 sts, ch 2, hdc in each st across to end of row, turn – 10 (11, 12, 12, 13) sts. Row 40: Ch 2, hdc in each st across row to last 2 sts, hdc2tog, turn – 9 (10, 11, 11, 12) sts. Row 41: Work even in hdc across row. Row 42: Rep Row 40 – 8 (9, 10, 10, 11) sts. Row 43: Work even in hdc across row. Row 44: Rep Row 40 – 7 (8, 9, 9, 10) sts. Row 45: Work even in hdc across to end of row. Row 45: Ch 2, hdc2tog, hdc in each st across to end of row – 7 sts. Row 46: Rep Row 40 – 6 (6, 8, 8) sts. Row 46: Work even in hdc across row. Row 2: Ch 2, hdc across row to last st, 2 hdc in last st, turn – 7 (8, 9, 10, 11) sts. Row 5: Ch 2, 2 hdc in first st, hdc in each st across to end of row, turn – 9 (10, 11, 12, 13) sts. Row 15-16: Work even in hdc across row. Row 27: Ch 2, hdc2tog, hdc in each st across to end of row, turn – 18 (19, 20, 21, 22) sts. Row 30: Ch 2, hdc in each st across row to last 2 sts, hdc2tog, turn – 17 (18, 19, 20, 21) sts. Row 34: Ch 2, hdc in each st across row to last 2 (2, 2, 3, 3) sts, leave remaining 2 (2, 2, 3, 3) sts unworked, turn – 15 (16, 17, 17, 18) sts. Row 39: Ch 2, hdc in each across row to last 3 sts, leave remaining sts unworked, turn – 10 (11, 12, 12, 13) sts. Row 40: Ch 2, hdc2tog, hdc in each st across to end of row, turn – 9 (10, 11, 11, 12) sts. Row 45: Work even in hdc across row. Row 45: Ch 2, hdc in each st across row to last 2 sts, hdc2tog – 7 sts. With MC, ch 82 (84, 86, 86, 88). Row 1: Hdc in 3rd ch from hook and in each ch across row, turn – 80 (82, 84, 84, 86) sts. Row 2: Ch 2, hdc2tog, hdc in each st across to last 2 sts, hdc2tog, turn – 78 (80, 82, 82, 84) sts. Row 3: Work even in hdc across row. Rows 4-5: Rep Rows 2-3 – 76 (78, 80, 80, 82) sts. Rows 6-7: Rep Rows 2-3 – 74 (76, 78, 78, 80) sts. Rows 8-9: Rep Rows 2-3 – 72 (74, 76, 76, 78) sts. Rows 10-11: Rep Rows 2-3 – 70 (72, 74, 74, 76) sts. Rows 12-13: Rep Rows 2-3 – 68 (70, 72, 72, 74) sts. Rows 14-15: Rep Rows 2-3 – 66 (68, 70, 70, 72) sts. Rnd 1: Work 9 dc in 4th ch from hook, join with sl st in tch. With 2 of the spots, create the tops of the antennae. To do this, weave the tail through the tops of the 9 dc and top of tch. Pull tight to form a ball. With RS facing and CC, join yarn to Hood, using photo as guide. Ch 5, sc in 2nd ch from hook and in next 2 ch, sc2tog last ch and same st as join – 4 sts. To make top of Antennae, sew gathered spot to top of stem. Repeat on opposite side for second Antennae. Sew spots in place using photo as a guide. Sew front to back at shoulder seams. Sew back seam of hood. Sew hood to neck edge. Sew buttons on bottom and front, slipping through hdc openings. Sew side seams, leaving armholes and leg openings open. With RS facing, join CC at bottom Left Front corner. Rnd 1: Ch 1, work sc evenly spaced around left leg opening, across bottom of Back, around right leg opening, across bottom right, up right front, around Hood, down Left Front, and across left bottom, working 3 sc in each corner, join with sl st in first sc. With RS facing, join CC at bottom of armhole. Rnd 1: Ch 1, work sc evenly spaced around armhole opening, join with sl st in first sc. Wow, that was a long pattern, but it has to be for all the different sizes. 🙂 I hope you’ve enjoyed this free pattern – be sure to check out my other baby patterns! I’m working on a pair of ladybug baby booties to go with this, too! This is adorable!! I hope I get a grandchild, so I can make one. Hi there thank you for this great pattern I couldn’t wait to make it, I have purchased the pdf and printed it off. Hi Amanda, thank you for your very helpful reply. I have made another one and it looks so cute thank you. I loved your pattern and made the 3 month size but made a bee pattern instead of lady bug. I used black for the first 7 rows for the back, left, and right pieces then alternated black and yellow every 2 rows for the remaining rows. Then for the hood I used yellow for the MC and black for the CC. Lastly, I made basic flat circles in 2 sizes to create the wings. I’d be happy to send you pictures if you’re interested! I’d love to see pictures! That sounds adorable! When I first designed this pattern I wanted to make it in two versions – a girl in a ladybug and a boy in a bee costume but I never got around to doing a bee. I think it would be so cute (and, of course, a girl can be a bumblebee, too!). That’s one great thing about having a basic onesie pattern to play around with because you can make it into other cute designs. 🙂 I bet your baby bee is adorable!